This entry was posted on Wednesday, November 25th, 2015 at 2:07 pm. 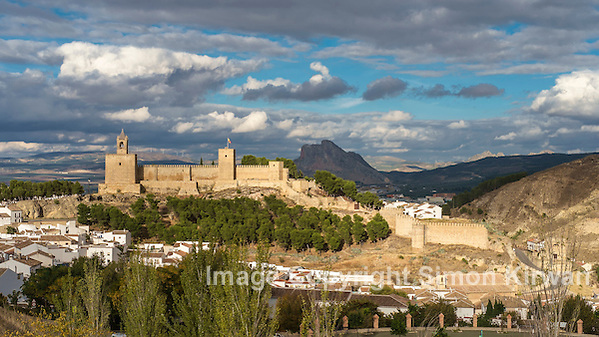 It is filed under News, Travel Photography and tagged with Alcazaba, Andalusia, Antequera, Malaga, Spain. You can follow any responses to this entry through the RSS 2.0 feed. Simon Kirwan has worked as a professional photographer for over 25 years, in various commercial and advertising studios in the north of England, until setting up Lightbox Photography in 1996. Having worked in most photographic genres over the years, since 1996 he has concentrated on location work, both in the UK and overseas, combining personal travel projects with commissioned commercial work for a diverse range of clients, covering aerial, architecture, event, editorial, publishing, corporate and lifestyle marketing. He specialises in organising logistics for overseas projects, and has worked in France, Spain, Holland, Belgium, Poland, Sweden and Denmark, as well as locations all over the United Kingdom. Aerial photography is carried out from a network of airfields across the UK, primarily based at City Airport Manchester, and utilises image geo-tagging for precise identification of locations. In 2000, Simon Kirwan was named The Observer Outdoor Photographer of the Year and has travelled extensively in Europe, USA, Asia and Africa, photographing people, places and mountains for The Lightbox Picture Library, which now contains over 20,000 images. He is the author and photographer of a series of regional landscape and aerial photography books for Myriad Books, and is equally at home in corporate offices, construction sites, light aircraft, mountain summits, live music concerts, convention centres, trade shows, exhibition venues, or sport stadia. Simon Kirwan is the official in-house photographer at BT Convention Centre Liverpool, and covers many corporate events, conventions and conferences at the venue for event organisers, and for ACC Liverpool, operators of BTCC. Simon Kirwan has trekked in the Himalayas, driven across East Africa in a truck, and photographed the cities and landscapes of Europe, USA and New Zealand. He can make all the necessary arrangements for a location photo-shoot, including models, stylists, assistants, locations, fixers, pilots, aircraft, flights, vehicles, and accommodation. Simon Kirwan also specialises in photography of the built environment, from the ground and the air. He has carried out aerial photography in the United Kingdom, Holland, Belgium and Poland, and has travelled all over the UK photographing properties for a major international hotel chain. All photography is produced using the latest state-of-the-art digital camera gear, and utilises a fully digital workflow from image capture to client approval and distribution via the Lightbox online image management system, providing instant access to high-resolution images for clients and media partners. The Lightbox is one of the UK’s longest-established photographic web sites, originally set up in 1995. Simon Kirwan is a member of the Association of Photographers (AOP) and the National Union of Journalists (NUJ). All photographs and text within this web site are copyright Simon Kirwan and/or the stated publication and are presented for web browser viewing only. Nothing contained within this site may be reproduced, downloaded, stored, copied, manipulated, altered, or used in any form without prior written permission from Simon Kirwan and/or the stated publication. Using any image as the base for another illustration or graphic content, including photography, is a violation of copyright and intellectual property laws. Violation of copyright will be actively prosecuted.